This Expert Advisor is a professional trading tool, which integrates a flexible risk control and six groups of trading panels. Most trading operations can be quickly made by clicking the button on these panels. Changing panels is quick just by clicking the green button. The panel includes two columns. The left column is about sell and the right is about buy. 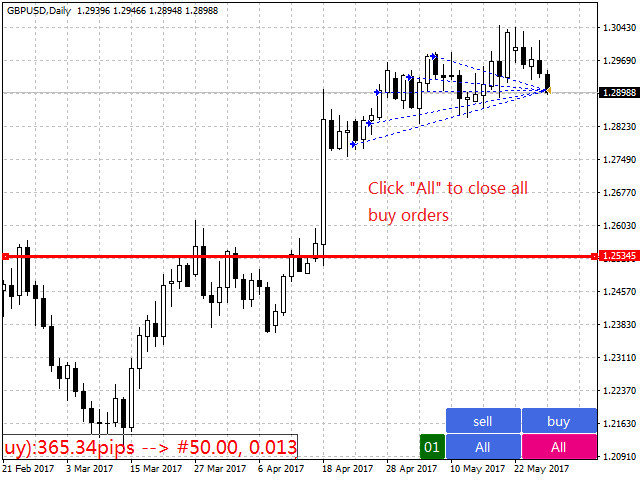 sell: open a sell order. first: close the first sell order. The first refers to Open Time. last: close the last sell order. The last refers to Open Time. all+: close sell orders in profit. all-: close sell orders in loss. max+: close sell order with the maximum profit. max-: close sell order with the maximum loss. min+: close sell order with the minimum profit. 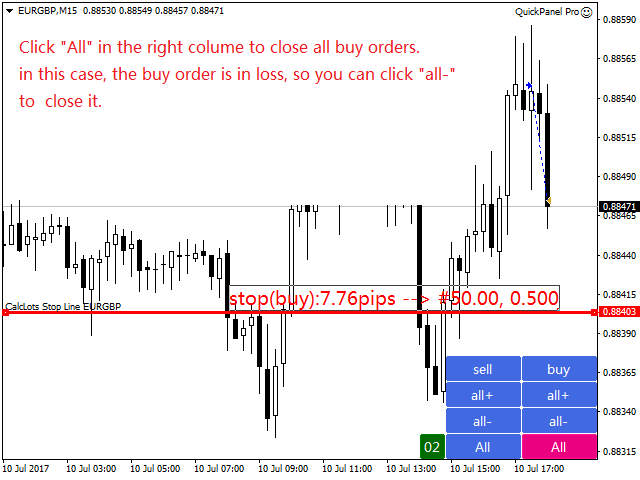 min-: close sell order with the minimum loss. All: close all sell orders. buy: open a buy order. first: close the first buy order. The first refers to Open Time. last: close the last buy order. The last refers to Open Time. 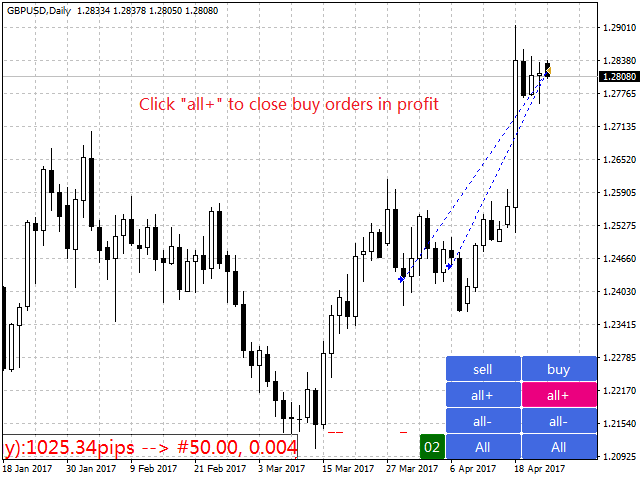 all+: close buy orders in profits. all-: close buy orders in loss. 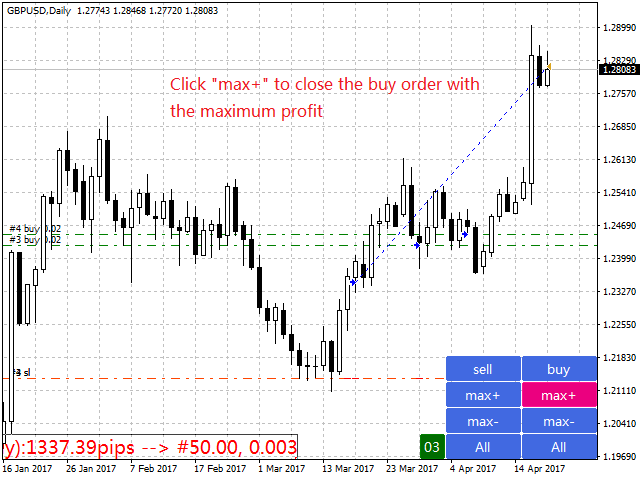 max+: close buy order with the maximum profit. max-: close buy order with the maximum loss. 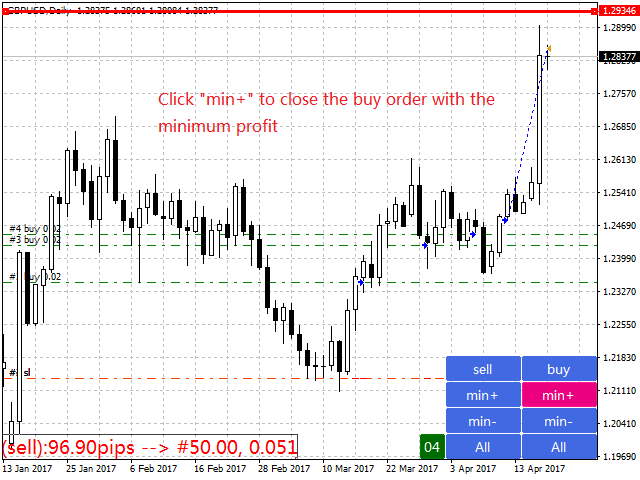 min+: close buy order with the minimum profit. 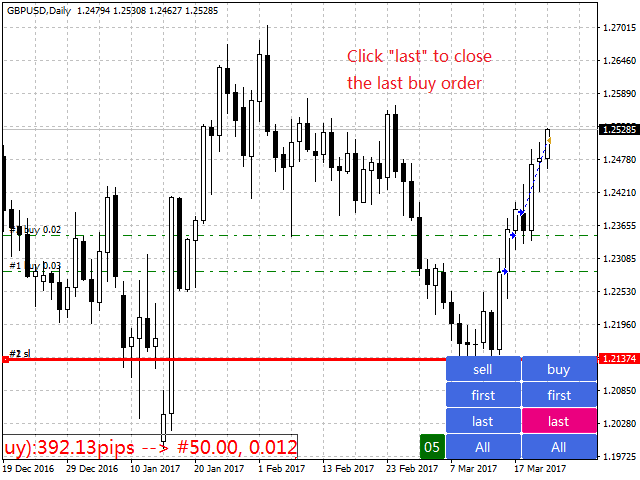 min-: close buy order with the minimum loss. All: close all buy orders. AlertLanguage: Select one from English and Chinese as language for popup Alert. Magic: Magic Number of orders opened by this EA. MaxBuys: The maximum number of buy orders. If it is 0, there will no limitation. MaxSells: The maximum number of sell orders. If it is 0, there will no limitation. RewardRiskRation: This is ratio of TakeProfit and StopLoss. LotsMode: This is a three-option input. The option is Fixed_Lots, Risk_Money or Risk_Percent. FixedLots: If you select Fixed_Lots as LotsMode, the EA will trade with the fixed lots. RiskMoney: If you select Risk_Money as LotsMode, the EA will calculate lots by the amount of risk money. RiskMoney means the amount of money that one order would lose. RiskPercent: If you select Risk_Percent as LotsMode, the EA will calculate lots by the percent of free margin. 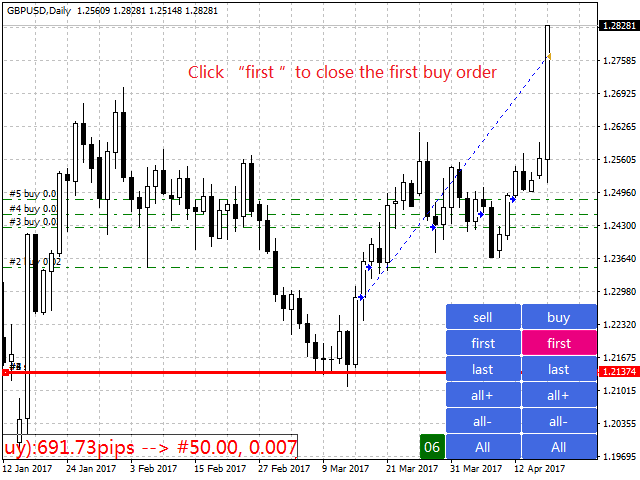 BreakevenLevelPips: The profit in pips to activate the breakeven function. BreakevenPlusPips: The breakeven plus this input as the stop loss. 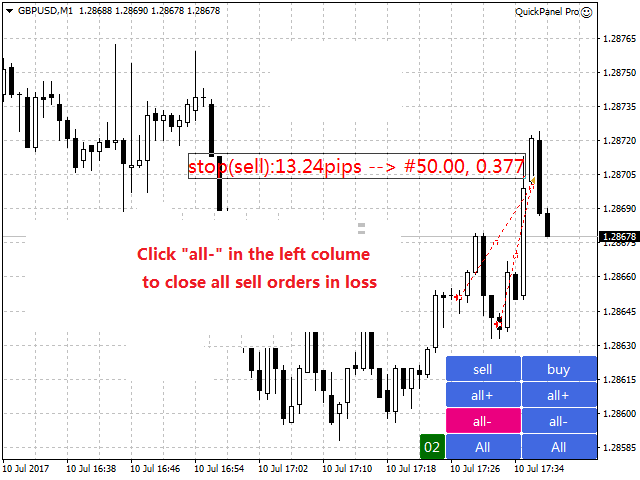 TrailStopPips: The stop loss distance in pips from the market price. PanelShiftX: The horizontal space from the right lower corner. PanelShiftY: The vertical space from the right lower corner. LineWidth: The line width of StopLine. LineColor: The line color of StopLine. LabelFontSize: The font size of LotsLabel. LabelColor: The text color on LotsLabel. Lots are determined by risk money, stop loss (pips) and the value of pips. The risk money is the amount of money that one order would lose. Stop loss is the distance between StopLine and market price. lots = 50/(100*10) = 0.05. In this case, the loss for every order is 50 dollars and it is relatively fixed. Why is it not absolutely fixed? This is because cross rates have not the fixed pips value, such as EURGBP, EURAUD, AUDNZD. lots = 30/(100*10) = 0.03. In this case, the loss for every order is not fixed, it will vary as the free margin. 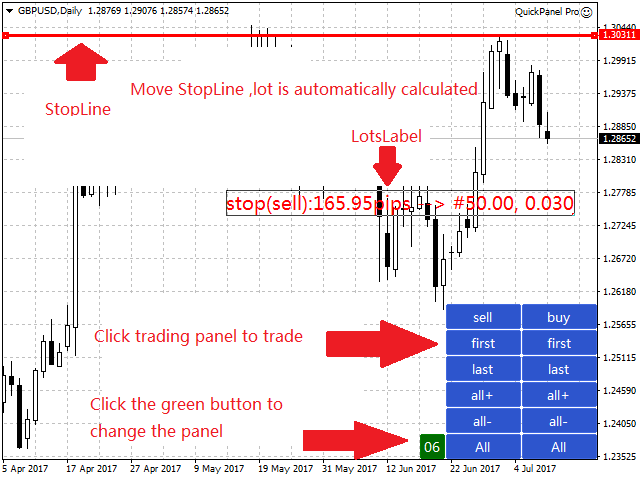 Quick Panel Pro: each order has SL/TP, and TP is equal to SL * RewardRiskRation. 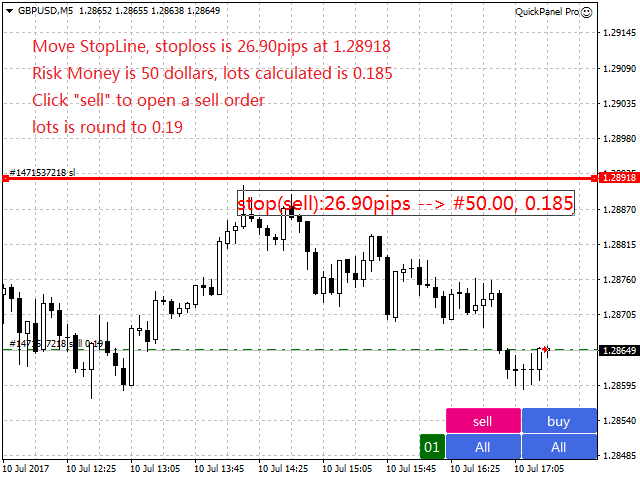 Quick Panel: each order's SL/TP depends on the input StopLossInPips/TakeProfitInPips, and TP is independent of SL.